Fowler, Martin. Is Design Dead?. 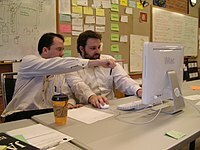 Extreme Programming Explained 所収, G. Succi and M. Marchesi, ed., Addison-Wesley, Boston. 2001, ISBN 0201710404 . Riehle, Dirk. A Comparison of the Value Systems of Adaptive Software Development and Extreme Programming: How Methodologies May Learn From Each Other. Tomek, Ivan. What I Learned Teaching XP. Beck, et. al., Manifesto for Agile Software Development.